You may already be a fan of peppermint candy, breath spritz and chewing gum, and your fandom is likely to increase manifold when you check out the benefits of organic peppermint essential oil. The peppermint plant, which originally hails from Europe, has such a peppy history of helping people’s health it’s been called the world’s oldest medicine. 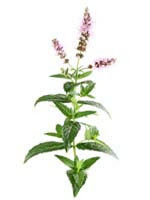 This is one so-called medicine, however, that leaves no bitter aftertaste, especially if you go for therapeutic peppermint essential oil as part of your aromatherapy lineup. If you already love the taste of peppermint, you’re sure to adore the crisply invigorating aroma. Part of the invigoration comes from peppermint’s menthol content. Menthol is well-known for its ability to provide instant relief from a stuffy nose, congestion, asthma, coughs, colds and other respiratory ailments. Organic peppermint essential oil can work equal wonders on your digestive tract, with the power to expel gas and soothe stomachaches and nausea. Peppermint essential oil uses include treating irritable bowel syndrome, urinary tract infections and as an antispasmodic that can help during colonoscopy and gastroscopy procedures. Your hair and skin can benefit from organic peppermint essential oil. Its cooling properties can soothe the scalp, kicking out lice and dandruff. Organic peppermint essential oil can provide your skin much-needed pep, with the power to improve oily skin while nourishing and enhancing all skin types. Pain can hit the pavement with the use of peppermint essential oil, including the all-encompassing pain of a toothache. Therapeutic peppermint essential oil contains calcium antagonism, also called calcium blockers, which serve as a natural pain reliever. Mayo Clinic notes calcium blockers have been helpful for alleviating migraines and high blood pressure. 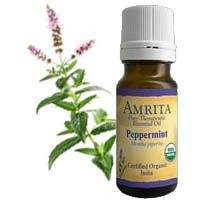 Peppermint’s soothing nature helps reduce high fevers in the body and high stress in the mind. Relief from headaches, depression and mental exhaustion falls under peppermint essential oil benefits, as does an escape from restlessness and anxiety. The oil can likewise give your blood circulation and immune system a boost, helping to circulate oxygen and prevent disease. While you may certainly find organic peppermint essential oil works wonders on its own, you can enhance its benefits even further when you combine it with complimentary essential oils. Try it with a bit of rosemary, marjoram, lemon or eucalyptus to push your aromatherapy experience into the fullest possible throttle.